Even in the dead of winter Sydney G. Walton Square is alive with quiet beauty. 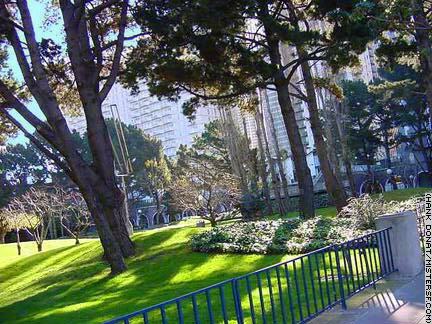 Named for a San Francisco businessman and cultural leader, the park is situated in a tranquil area between Front and Davis Streets, and Jackson Street and Pacific Avenue. The park is busy during the lunch hour but perfect for a reflective visit almost any other time. Highlights include a ring of poplar trees and a fine outdoor sculpture collection. Works installed here are Joan Brown's mosaic Pine Tree Obelisk, George Rickey's Two Open Rectangles, Francois Stahly's bronze Fountain of the Four Seasons, and other great bronze work including Jim Dine's Big Heart on the Rock and Marisol's Portrait of Georgia O'Keefe. Not to be missed is San Francisco sculptor Beniamino Bufano's The Penguins, located just outside the park at Jackson and Davis.